Am I using what I have well? Are my processes efficient and effective to take advantage of the technology? Do my people have the right skills, mindsets and capabilities to deliver on all the various aspects marketing has expanded into – from SEO, to demand gen, to lead conversion, to e-commerce, to branding, storytelling and brand personas, to email, social and digital marketing…? Are my strategies going to create the kind of lead conversion rates that will enable to expansion of my team and the respect that they should garner from the senior leadership team? Do I have the right customer analytics strategy and can I execute on the data and data warehouses that are required to really know my customer and service real-time information where (channels & devices) when they need it? To help CMOs meet skyrocketing customer and boardroom expectations, The CMO Club, along with Oracle, released “The CMO Solution Guide for Building a Modern Marketing Organization.” The guide, which is based on interviews with CMOs and digital marketing leaders from major brands including Dow Chemical, JetBlue Airways, MasterCard, PayPal, Quiznos, The Hershey Company and Viking River Cruises, includes insights and best practices that CMOs can apply to build customer-first marketing teams that drive measureable results. To help marketers successfully manage this transformation, the new CMO Solution Guide provides practical advice from 20 in-depth interviews with CMOs and digital marketing leaders from organizations of various sizes and different industries. Acumen: To become more effective modern marketers, respondents reported that enhancing the skills within their department has become a top priority. From developing valuable customer insights through data mining to investing in content creation and the need for greater evaluative analytics, leading marketers are investing heavily in helping their teams learn new skills. Alignment: From top to bottom and across all functions, the guide shows that it is critical for all departments to follow the same processes and company culture in order to effectively engage customers across all touchpoints. Agility: To meet consumer demands for exceptional customer experience, the guide noted how important it is for businesses to have strong cross-functional teams and the flexibility to pilot something new to test and learn best practices. Accountability: To demonstrate marketing’s impact on the bottom line, the guide recommends establishing the right measures from the outset and instilling a culture of personal accountability around those parameters. Along those lines is a larger question that looms in most organizations. That question is who should be the general manager of the overall customer experience? CMO’s are well positioned to be that person, but there are risks as well as rewards in taking on that responsibility. I’ve outlined some of them in a new report Should the Chief Marketing Officer Oversee the Whole Customer Experience? And I look forward presenting the accompanying webinar coming up later 2016. While most brands may not realize it, they are competing on one important variable: customer experience. With all other things being equal, we are in a service economy and there’s nothing that is more important than the experience customers have with companies. And it’s not the brand promise creating by marketing that makes up that customer experience, but also the experience customers have with sales, service and back office operations. It’s not an easy question, but one that must be answered by every senior leadership team and their board of directors. That is what digital disruption is all about and companies not understanding this will go out of business or be acquired or merged for their customer list and cash flow. Poor customer experience, no business. Period. It’s that simple. My report is about how CMOs can use big data and analytics to transform marketing decision-making and advance corporate innovation by using big data to optimize your marketing efforts. The way I went about writing this report was I interviewed both vendors and CMOs to understand where the market place is with respect to actually using marketing automation software / platforms. There is a lot of software that delivers on the promise, unlike 25 years ago when CRM- Marketing, Sales and Customer Service vendors (either point or suites) had the right ideas and desire to provide this type of business impact, but the software really wasn’t not as advanced as the marketing brochureware (sales pitch and slides) was. In addition, from working with CMOs when I was in the agency world and throughout my career, the story has been very similar. Software has the potential to create and drive revenue when it’s attached to the right strategy. Technology without the right strategy just means we do more of the wrong things faster. That’s not such a good idea, though it happens every day. 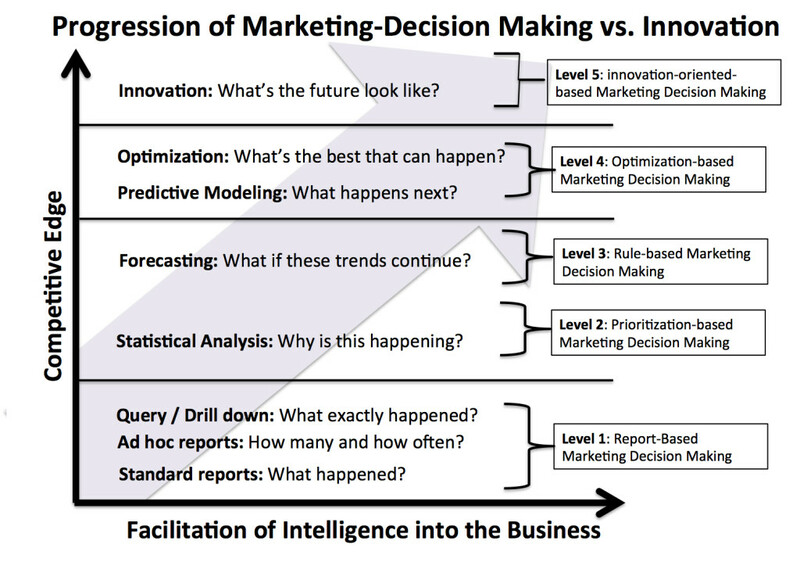 You can’t change what you “don’t know, you don’t know.” In the report, I provide a picture for Marketers so that they can self identify where they are in the various levels of using marketing automation and then to identify what they’d like to be doing. In consulting or advisory work, this is often known as a “gap analysis.” It helps people see the present as well as the possible future state. What we found in the research is that many Marketers learned that the way they were using marketing automation software as at Level 1 &2. They do not realize there’s more they could do. Others found that they have not chosen software that help them advance their Marketing capabilities to Levels 3, 4, and 5. In the report, I describe some ideas on what those other levels are and what it might look like. In theory, let’s say that Marketing really drove revenue in your company. The idea I’m really aiming for in this report is to provoke CMOs and Marketers to think about becoming chief intelligence and revenue officers. When they are able to show that they can repeatedly and consistently contribute to bottom-line, the senior leadership team will give them respect they want. Long gone will be the days of suffering from what I lovingly call the “Rodney Dangerfield Affect” – i.e., the day of “they just don’t get enough respect” won’t exist anymore. And that would only be a good thing. Because Marketing software has changed over the last 25 years and can deliver on may more of the promises it aspired to, Marketers must also change. But there is a gap in the talent pool of CMO’s and Marketers that understand how to use marketing automation and customer experience platforms to get to Level 4 and Level 5 activity (see the report). And that’s what I really want to see happen and why I wrote the report. It’s time that we use all this big data revolution and new technology and transform old roles into new roles where respect for the contribution is earned and acknowledged. Fill the skill sets in your organization so that you are able to truly justify to your senior leadership team why you want a larger budget and new technology. I don’t think you can wait to do this. I think it will only going to get worse, not easier to pick the right technology for today’s CMO and Marketer. Make sure you are prepared by educating yourself on your options and learn how to choose technology so that you can show your contribution to the bottom-line. I’d love to hear from some folks who have mastered some or all of :choosing technology and business justification capabilities”— how you did it! You never know, you might become part of my disruptive case studies library! I know you’ve seen these types of dramatic headlines before: The CMO is dead. But in actuality, the roles in marketing, sales, and customer service that once governed how business “gets done” are shifting. This best practices report, Data-Driven Marketing Campaign Optimization is about how CMOs can use big data and analytics to transform marketing campaign decision-making and advance corporate innovation and revenue. What’s driving this shift? A great deal of the shift in roles is being driven by technology that is now available. In attending many conferences over the years, especially in the last 2 years, the technology has changed very dramatically and delivers on many of the promises CRM (Marketing, Sales and Service) wanted to deliver on, but just honestly the technology wasn’t there yet via its fullest capabilities to do this. Now that we have technology that can deliver more than ever before, we have to make sure that people know how to use it and use it well. You can read the rest of this blog post to understand my point of view on this or jump right to a snap shot of the report. 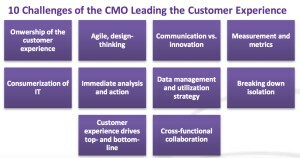 CMO‘s Paradigm Shifting To Innovation and Revenue Officers I know it’s often tough being a Marketer and not getting the credit due. You might find yourself suffering from what I call the Rodney Dangerfield Affect, meaning you don’t get enough respect in your organization. I get it. But let’s put that idea in the past. You can get credit; you just really need to know that there is a new way to do marketing and the tools and platforms are there to support you. In the past CMOs were charged with top of the funnel activities, driving qualified leads to Sales. It was then Sales job to take the lead and close as many as they could. But just like we know the earth isn’t flat (old paradigm) revenue generation is now not just the mission of Sales (new paradigm). 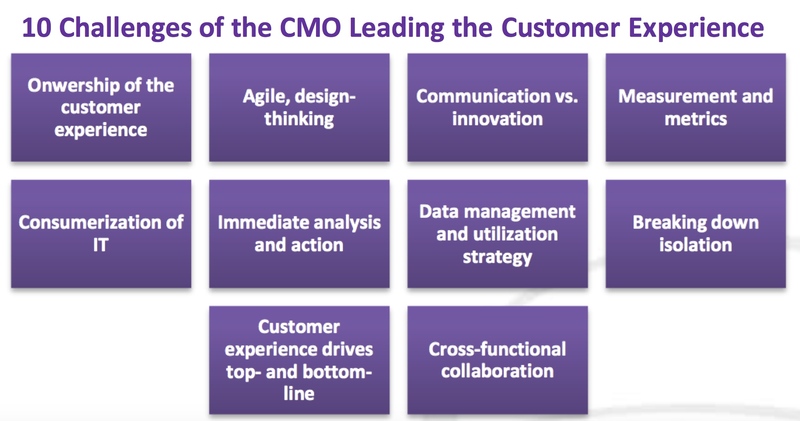 In fact, the CMO role is changing and changing fast. The reason? Because the technology today can show what the Marketer has contributed to the bottom-line. And that’s what you as a Marketer need to know and need to focus on— for your career and for your company. While there’s lots more to cover in the transition from the old paradigm of Marketing as “top of the funnel” people – to the Chief Information and Revenue Officers— if you are a Marketer who is interested in the “new world”, this report is a good first step in taking a look at not only where your organization is at with respect to how they view marketing, but also how you, as a Marketer are approaching Marketing. I’ve created a 5 level of Marketing Automation and Campaigns capability matrix (see the above figure). Often times you may not know what level your organization is at or what else you could be doing. This maturity level overview helps you to see where you are and also what other levels you can achieve. As you choose technology, ask yourself, can I show how I generate revenue with this technology? And if I have the right technology, how am I going to present that I am contributing to the bottom-line to the senior leadership team? Change Means Politics Heat Up As part of any change in an organization, you’ll want to be careful of organization change management issues that come up with change. The roles of Marketers and Sales are both needed and provide great value. But if Marketers are becoming Chief Revenue and Innovation Officers because they have a lot of data and know how to use it to close sales, make sure to think through how that might affect other departments (Sales, IT, Customer Service…) And if / or when Marketing transforms into a “Revenue and Innovation Organization” what now is the role of Sales, IT and Customer Service? Redefining Roles In one particular company that I worked with on this this transformation, Marketing became responsible for the top and middle funnel revenue drivers. Sales then transitioned into executive account management and renewals: they were really the relationship builders and maintainers. And Customer Service delivered on the “promises” made by Marketing and Sales by integrally working together with Marketing and Sales. This meant that all three departments knew what their new roles were and the importance of customer lifetime value (CLTV). They knew that all three department’s goals were to collaborate to increase CLTV so that customers, whether it was a B2B or a B2C company, spent more time and money with the company over longer periods of time- hence increasing the customer life time value. What business experts are really striving for with Big Data is to create blue ocean strategies where the competition is irrelevant; we learned that from the authors of the Book, Blue Ocean Strategies, W. Chan Kim and Renée Mauborgne. We also learned from W. Edwards Deming, that if we listen to our customers and our employees and take that data, we’d have better products, services and companies — which help to build companies that become their own marketplace or live in an uncontested market space. And that’s what can be done with all the data that we have today — if CMO’s know what to do with it. Making Cross-Functional Collaboration The Most Rewarded Executive Activity In this particular company, when cross-functional collaboration was a primary part of their culture, Marketing wasn’t spending millions of dollars to acquire customers only to have the other departments provide such poor relationship building and service that the customer’s defected. Instead they made sure that once the customer had bought and come on board, Customer Service delivered on promises by Sales and Marketing. (In your company, it might mean people in these departments have to talk to each other…) Now that’s an interesting concept! This is just one company’s take on how they approached these issues. I’d love to hear what you think about the report. There’s much more I could / need to cover in this area. 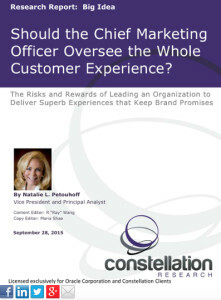 This report just a first look at the idea of CMOs transforming into Chief Intelligence and Revenue Officers.